Los Angeles based CJS Quintet returns with their second release on ConceptSound Music. Let's PLAY! evokes a wild ride on a winding road with its driving rhythms, soulful harmonies and ebullient solos. CJSQ is saxophonist Chuck Johnson (Temptations, Billy Higgins,Bloodstone, Francisco Aguabella, Buddy Collette), trumpeter James Smith (Teddy Edwards, Ray Charles, Temptations, B.B. King), bassist Wendell Williams (Jimmy Scott, Teddy Edwards, Bobby Caldwell), pianist Al Daniels (Ronnie Laws, Gerald Albright) and drummer Anthony Davis (Dave Brubeck, Marcus Roberts). Let's PLAY! recorded in Pasadena, California at No-Sound Studio by Nolan Shaheed (Marvin Gaye, Count Basie, Stevie Wonder). 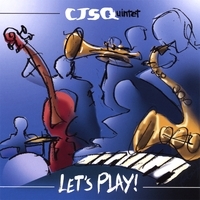 Let's Play is an enjoyable journey by talented musicians. The dedication to the craft comes out in the music. Day or Night, place it in your CD player and enjoy the ride. In a world of "smooth jazz", "acid jzz", "postmodern jazz" and hip-hop jazz, it's nice to know that there are groups that are playing old skool Be-Bop jazz the way it was meant to be played. Thes CJS kats, who have collectively worked with almost every name in the Jazz hall of fame, are the yet-to-be discovered treasures of west coast jazz. The recording itself is startling in its clarity and precision, both from the standpoint of the band's near-flawless playing and the quality of the sound that the disc captures: Each instrument is precisely situated within the sound signature, carefully balanced against the others, enabled to achieve is proper voice, timbre, and sonority. Explosive, heady, emotive, sophisticated, approachable: This is REAL JAZZ at its absolute finest.